Buried away behind a locked door in a meeting room at the Computex trade show in Taiwan, we caught an early glimpse of several new CPU coolers from the German manufacturer Be Quiet! Two of these new coolers are based on the existing Dark Rock Advanced and Dark Rock Pro models that we recently gave very positive reviews for on Bit-tech. In fact, we gave both models a thorough thumbs up, each winning an award. 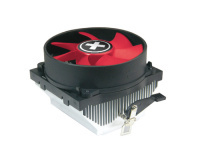 The new upgraded versions of the coolers ditch the existing Silent Wings 120mm fans in favour of noticeably larger 135mm fans. Two are used on the Pro version and only one on the Advanced model. Be Quiet! has also revised the mounting mechanism so that in the Be Quiet! 's marketing manager's own words 'they no longer take 20 minutes to mount.' Given that the overcomplicated mounting mechanism of the originals were the only faults we could find with them, this is very welcome news. You should expect to see the upgraded Dark Rock Advanced and Dark Pro coolers hitting retailers in a couple of months time. In the meantime, let us know your thoughts in the forum. 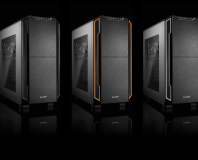 Answer one simple question to be in with a chance of blagging a new case (EU residents only). Low-profile design for 130W TDP.